A grizzled and battle scarred man, with many hard years behind him, sits quietly in his home while soldiers pound at the door. Count Rocco, a legend known as the Lion of Aurelianum and a killer of kings, waits for judgement. Whose judgment he’ll face first, gods or men, remains to be seen. Without a doubt, Rocco has done terrible things, killed many men over the course of his life, but he always believed in his cause. Does that make the difference in the Grand Scheme? Maybe if we knew what series of events led him to this point, the question of whether or not Rocco was a “good man” would be easier to answer. Young Rocco, a child living with his father and sister in Germania, has it pretty good. Bor, his father, is a noble, and his sister Emma is a good prospect for marriage into any highborn house. When Bor is visited by an old friend, King Chlodio no less, everything seems to be going well. 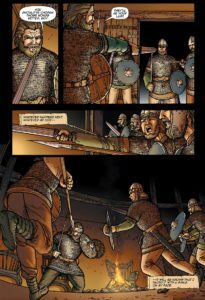 But when Chlodio calls his trusted friend to war against the Romans, Rocco’s first steps along a chaotic and violent path are taken. Heirs of Rome is a good example of historical fiction presented in a comicbook format. The reader is given a front row seat as Rocco grows from a pampered noble lad into a violent man on the hunt for revenge. Everything you could possibly think of is here: violence, intrigue, betrayal… think Game of Thrones set at the fringes of the Roman Empire. Toni Karonen doesn’t shy away from any of the darker aspects of the story, and has avoided anything remotely resembling an easy path. Even though Rocco is presented as the protagonist of the tale, he’s not always the most likeable or sympathetic guy… not at all the noble-born warrior poet we’ve all seen over and over. 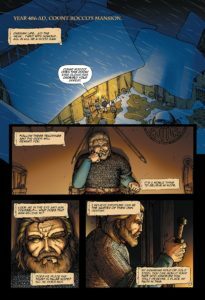 Very much like his creator- Karonen, I mean, not Woden- Rocco approaches his challenges head on, the philosophy of “the only way out is through” seeming to weigh heavily on both their choices. As a writer, choosing historical fiction is a pretty bold move. It’s one of those things that you have to get right because there will always be someone out there calling you out on any mistakes you make. Karonen handles it all well, having obviously done a wee bit of research on the chosen setting. 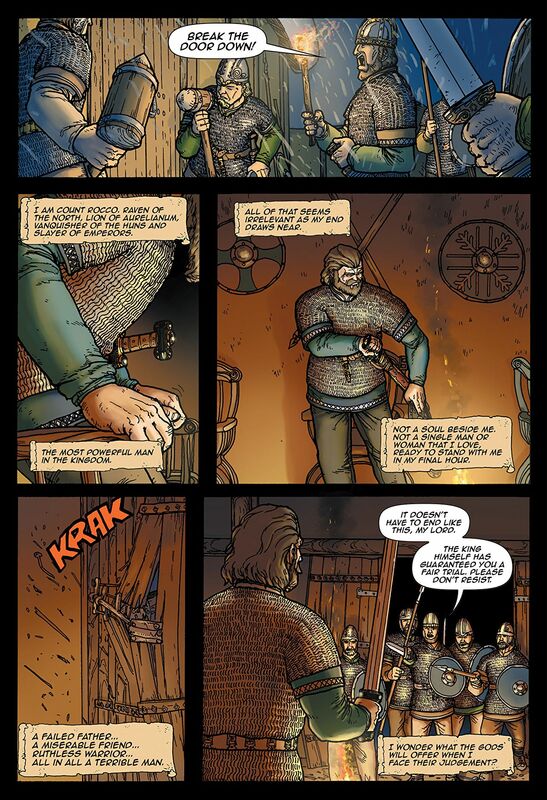 Coming in with the assist on the graphic part of this “graphic novel” is Juuso Laasonen, and I have to tell you that he’s embraced all aspects of the word (graphic). His illustrations are bright and vivid, displaying plenty of detail for the reader’s eye to take in. 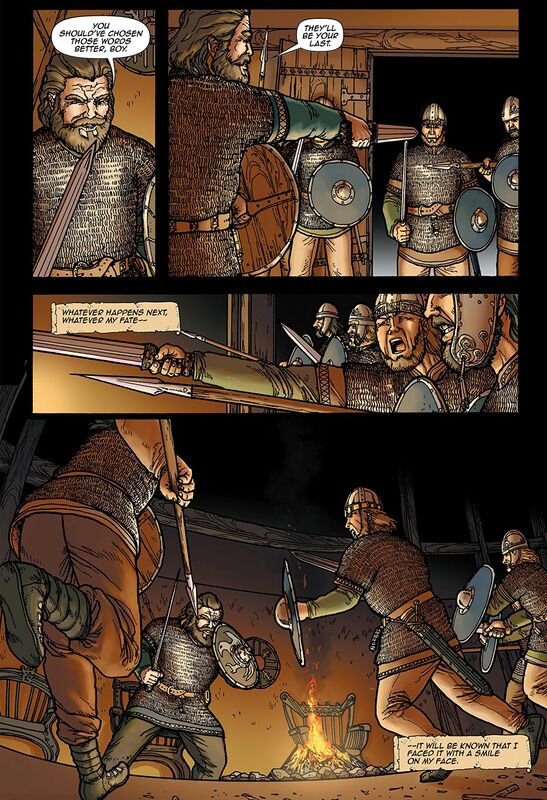 That detailed style carries over, without flinching, into the scenes of explicit violence where Karonen’s story goes full on “Braveheart”. 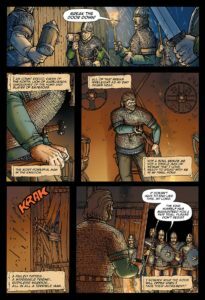 Laasonen’s work is eye catching, and to be honest, it was a sampling of his artwork that convinced me to accept Karonen’s invitation into this tale of mayhem, murder, and morbidity. There are some parts that seemed a little rushed, but keep in mind that this one volume follows Rocco as he grows from child to adult. There are many events and tragedies to cover, and without knowing how many books are planned for the series it’s tough to say whether or not the jumps in the narrative were necessary. Every writer has to come to grips with the reality of getting from point A to point D, without spending so much time on B & C that their story loses momentum. That could very easily be the case here. 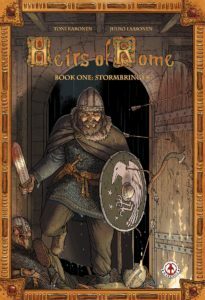 In the end, my opinion is that Heirs of Rome is a solid title with room to grow, and a worthy addition to any history buff’s pull list.